Mule Deer are our specialty! Trophy Hunters Alberta is Alberta's premiere Mule Deer outfitter, owning some of Alberta's best allocations for the species throughout central, eastern and southern Alberta. THA owns 224 big game mule deer allocations, representing more than 6% of the mule deer allocations in all of Alberta. With about 450 Outfitters in Alberta, we certainly have the most flexibility possible. 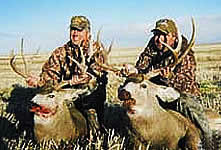 The Province of Alberta has the enviable reputation of being the destination of choice for hunters in search of a world class quality mule deer hunt. Most years, our hunters have 100% hunt success when mule deer is their primary species and in each of the last ten years, our mule deer rifle hunters have harvested several huge mulies scoring 170 to 190+ B&C! Visit the Trophy Hunters Alberta mule deer photo gallery to view over 450 pictures of our guests' successful mule deer hunts over the last several years. Our Open Country Foothills and Prairie spot and stalk style Mule Deer hunts have gained widespread acclaim in recent years by hunters from all over North America and beyond. These are our most popular hunts and many of our mule deer hunters routinely report seeing over 100 mule deer per day during their hunt. Officially, we state that we hope to show our hunters minimum 140 class mule deer, however our experience indicates that each year many of our hunters harvest 160 to 180 class muleys and sometimes 190+ class. THA offers both archery and rifle hunting experiences in some of Alberta's finest mule deer territories. 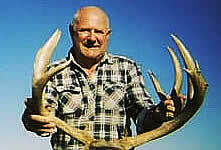 The world record non-typical Mule Deer comes from Alberta. We offer a range of accommodations from working ranches to B&Bs, guide's homes, cabins, motels and full service lodges in the breathtaking mountain, foothills and prairie regions east of the Canadian Rocky Mountains. Our Mule Deer hunts offer the highest opportunity and harvest rates of all our Big Game Hunts, and our flexibility as Alberta's premiere outfitter provides our clients with the most individualized options available for hunting Mule Deer. We have been told by many hunters that we have some of the best Mule Deer hunting in the world. THA has the experience, resources and professionalism to run the highest quality Mule Deer hunts available in North America today. Since the inception of the mule deer draw system, 10 years ago in the Foothills and many years ago in the Prairies, we have seen a large drop in the number of mule deer hunters and an increasing number of large mule deer surviving the hunting season and thus propagating their incredible genetic characteristics. These two factors make Alberta arguably the world's best area for hunting trophy mule deer. Our wide selection of mule deer hunts are described in more detail below. THA's Primary Archery Mule Deer hunts take place in Alberta's top producing Mule Deer zones. Such territories include the Porcupine Hills area in the expansive foothills of southwestern Alberta ('Foothills' in WMU 304), the eastern slopes Mountain and Foothills regions of the Canadian Rocky Mountains ('Mountain' in WMUs 318, 320, 322, 324, 326, 330, and 429), the trophy zones of the southern and eastern Alberta prairies ('Prairie' in WMUs 110, 134, & 140), the Calgary Bow Zone ('CBZ' in WMU 212). We offer four distinct types of Archery Mule Deer hunts. THA's Primary Rifle Mule Deer hunts take place in Alberta's top producing Mule Deer zones. Such territories include the rural and public forested areas NW of Calgary that lead into the eastern slopes of the Canadian Rocky Mountains ('Mountain' in WMUs 318, 320, 322, 324, 326, 330, 429), the Porcupine Hills area in the expansive foothills of southwestern Alberta ('Foothills' in WMUs 304 & 305) and the trophy zones of the southern and eastern Alberta prairies ('Prairie' in WMUs 104, 106, 110, 134 & 160). No other outfitter approaches THA on overall Mule Deer hunt options and hunter success. We offer three distinct types of Rifle Mule Deer hunts. 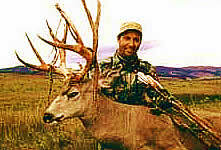 THA offers a wide range of Mule Deer hunts to meet most every requirement of a discerning Mule Deer hunter. Mule Deer are our specialty - we know what we are doing and we get results. Our official position is that we expect to show our hunters minimum 140 class mule deer or larger. Yes, we do get larger muleys as witnessed by our 4-year average of 160 B&C average score for our mule deer. However, we do not want to mislead any hunter into thinking that he simply has to book a hunt with THA and turn up and have a first day opportunity at a 190+ class mule deer. We assure you that we have had hunters who, in spite of many communications, hear what they want to hear and not what we have really said. It is extremely important that every hunter is realistic. We want to get the big one just like every hunter who hunts with THA. 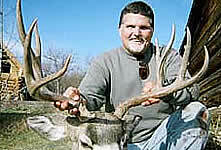 There is no doubt that we have the best mule deer hunting areas and very experienced guides. These are the criteria that typically ensure a successful hunt and another returning THA hunter. Transportation for all of our mule deer hunts is primarily in a 4x4. Alberta is big country and the tested and proven method for finding and harvesting trophy mule deer is covering lots of extensive territory, glassing all possible bedding and feeding areas, being in good physical condition and hunting long and hard. We will find mule deer in their preferred habitat and we know what that is and where it is located. We typically do not use remote camps for our mule deer hunts since the largest quantity and best quality of mule deer tend to be harvested from more open rural country. This open country has woodlots and some bushes, but frequently consists more of long grasses and brush on huge rolling hills where natural ground blinds, field swales, fence rows and other natural outcroppings allow for stalking these magnificent animals. In our 'Bush' mule deer hunts, there is obviously more cover available to the muleys and, as a result, our 'Bush' muley hunters do not see 'hundreds' of mule deer during their hunt. As well, we provide low cost optional mule deer hunting as a secondary option on many of our elk and moose hunts. It is important that hunters understand that, on these hunts, mule deer are not as plentiful and are not a priority species that we will spend any real amount of time hunting - unless of course we harvest the primary species early in the hunt. We do not describe our 'Bush' hunts or secondary option mule deer hunts as 'Trophy' hunts, although there are trophy muleys to be had on the these hunts. We include wolf & coyote hunting in all of our mule deer hunters. The odds of seeing a wolf are low in most areas, however, we usually harvest a few wolves each hunting season. Alberta coyotes are plentiful and generally larger than typically seen elsewhere. All our Mule Deer hunts are fully guided with 2 hunters per guide (except the Prairie Rifle hunts which are guided one-on-one) and are all-inclusive (airport service, guiding, accommodation, meals, rough caping & transportation during the hunt). There are no hidden, or surprise, charges and no trophy fees. One-on-one guiding is available on most hunts at an additional cost of $1,500/week. Also, non-hunters are welcome at an additional $1,500/week per person. To book your Mule Deer hunt with Alberta's most respected big game outfitter, and Mule Deer specialist, please phone us toll-free @ (877) HUNT-YES <(877) 486-8937>. We are also booking future year hunts at current prices. We also provide big game hunts for Moose, Whitetail, and Elk as well as numerous combination hunts. Please let us know if you would like more information on these other species hunts.